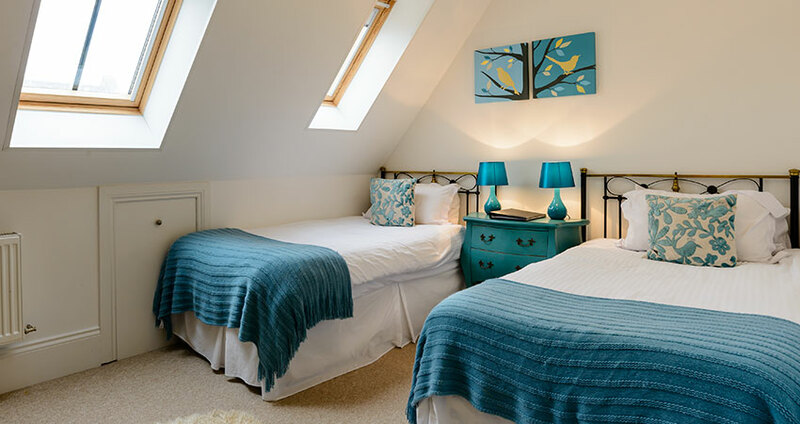 The Annexe at Alexander House is luxurious self-catering holiday accommodation that sleeps up to 4 people in the self-contained adjoined annexe to the main house. Both the annexe and the main house can be rented together to provide exclusive use accommodation for up to 25 guests. It caters for all ages and provides every creature comfort you could ask for, in relaxed yet luxurious surroundings. The annexe offers an open-plan kitchen, breakfast and living room on the first floor which provides a cosy daytime space. There is a table for relaxed meals and a comfy corner sofa with 50inch LCD TV with Sky & Sky Sports. On the first floor there is one double/twin bedroom and two cosy eaves bunks - ideal for the kids or perhaps two friends joining you for a walking weekend. There is a private parking area and space for muddy walking boots and for drying off the dog! Up to two well-behaved dogs are allowed by prior appointment. From the private parking area, there is a gate into the private fully fenced garden, with raised hot tub with stunning views, outdoor table and chairs, children’s play area with sunken trampoline, swings, slide and seesaw. All bookings are subject to our Terms & Conditions - Self Catering Holidays. I have decided to move in here, it is awesome! WOW - sat in the hot tub at 9am watching the deer on the hill. We will have to come back! Everything in this house is perfect. Entertaining is very easy in fantastic surroundings. Wall to wall snow (outside!) made it even better, if that was possible. Wishing you many, many happy years with this beautiful house. Having viewed the website and read all the information, we were expecting luxury but it still didn’t prepare us for Alexander House, the pictures simply can’t do it justice. The views are just spectacular, and even a thunder and hail storm just added to the experience because it was so dramatic! What a fantastic time we had at Alexander House this year. We regularly rent a house at this time of year and this house has been the best house in terms of design, size, layout, views and extras. All the children who stayed did not want to leave! Thanks again for sharing your wonderful house with us. My DREAM kitchen! Oh I so want to pack it up with me and take it home, but then I want all the house too :). Will be back very soon! Actually perfect! Could honestly not have hoped for anything more. Thanks. Thanks. Thanks. Lost for words, what a magical place. Looking forward to next year!